(CNN) -- Seven-time Tour de France champion Lance Armstrong has admitted that tension has increased between himself and Astana teammate Alberto Contador, as both riders battle for the yellow jersey in the 2009 Tour de France. Armstrong is playing a waiting game until the vital stages in the Alps. Normally each team directs its riders to support just one candidate for the top prize, a tactic that has been confused with two big-name riders from Astana riding so close to the lead. After nine stages Armstrong, who sensationally came out of retirement to compete in this year's event, sits in third place overall, eight seconds behind current leader Italian rider Rinaldo Nocentini and pre-race favorite Carlos Contador, who is six seconds off the pace in second. The 37-year-old Texan told France 2 Television that there is an uneasy truce between them and that both were intent on winning. "The honest truth is that there is a little tension," Armstrong said. "Contador is strong, and he is very ambitious." Armstrong believes that the race will be decided in the tough mountain stages in the Alps next week and that he would only play second fiddle if Contador proved himself the best rider. "There's not going to be a lot of change until Verbier," Armstrong said, referring to stage 15, a mountainous 207.5km stage Pontarlier and Verbier in Switzerland. "We'll have more moments there when we'll see who's truly the strongest." Spain's Contador took 21 seconds out of Armstrong on the seventh stage to leapfrog him into second place, but the Texan hinted that he was riding in the interests of the team by not chasing him down. 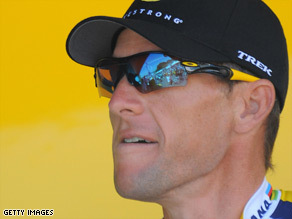 "I wouldn't say that I could have easily followed, because it was an impressive attack," Armstrong said. "I probably could have gone, but I didn't see it coming and it wouldn't be correct for me to go across. So, I waited for the other guys. I expected them to be able to pull it back and they didn't, but that's life, that's cycling, and I had to do the right thing." The Tour de France contenders are having a welcome rest day in Limoges on Monday before a series of stages which are expected to favor spinsters or breakaway groups including riders who have no chance of overall victory. Nocentini, who has ridden superbly to keep the yellow jersey he won after being part of a breakaway group on stage seven, is predicted to stay in the race lead for another week. But come the stages in the Alps, which begin next Sunday the focus will fall on Armstrong and Contador and their battle to win cycling's most prestigious race. Win or lose, Armstrong also strongly hinted that he would continue his remarkable comeback for one more year. "Probably not. Probably not. Maybe one more Tour."